Boca Juniors extended their unbeaten run to fifteen matches with this comprehensive win over an out-of-form Estudiantes team. Both sides were without arguably their most established players with Boca’s Fernando Gago currently injured, and Alvaro Pereira unavailable for Estudiantes as he is on international duty with Uruguay. The starting line-ups: 4-3-3 for Boca. 4-4-2 for Estudiantes. Boca Juniors are similar to Guardiola’s Barcelona in style. They build-up steadily, playing out from goalkeeper to centre-backs in the first build-up phase. Erbes would drop, allowing the centre-backs to spread and the fullbacks would push up. Erbes was key in the early build-up, creating 3v2 superiority with his centre backs against the press of Estudiantes’ centre-forwards while also drifting wide to create numerical superiority against Estudiantes’ pressing of Boca’s fullbacks. This wide superiority came in the form of passing diamonds with the CB, FB, CM and Erbes against the winger, centre-forward, and central midfielder of Estudiantes. The away side’s wide midfielders and centre-forwards pressed high up the pitch and with great urgency however this was not matched by the rest of the team who were more position, rather than man, orientated. Boca players could often drop to receive passes unmarked, allowing them to turn or to produce some excellent combination play. Boca’s fullbacks played very high up the pitch in the first build-up phase, with either Perez or Melli often filling in the channel between centre-back and full-back. The fullback were also vital when Boca had possession in Estudiantes’ half of the field. The home side put emphasis on making inroads into the opposition’s half with switches from fullback to fullback (mostly via the centre-backs) to exploit space on the opposite side of the field left by Estudiantes’ narrow, rigid midfield four. These switches were facilitated by Estudiantes’ 4-4-1-1 shape in their own half, as there was only one player to pressurise Boca’s centre-backs. Estudiantes’ midfield four was so narrow at times that a wide midfielder would often drop in between the fullback and centre-back as the fullback went to close down a Boca player in wide areas. Interestingly, this was also used at times in attack, as an Estudiantes wide midfielder would drop into the back four while the full-back surged forward. 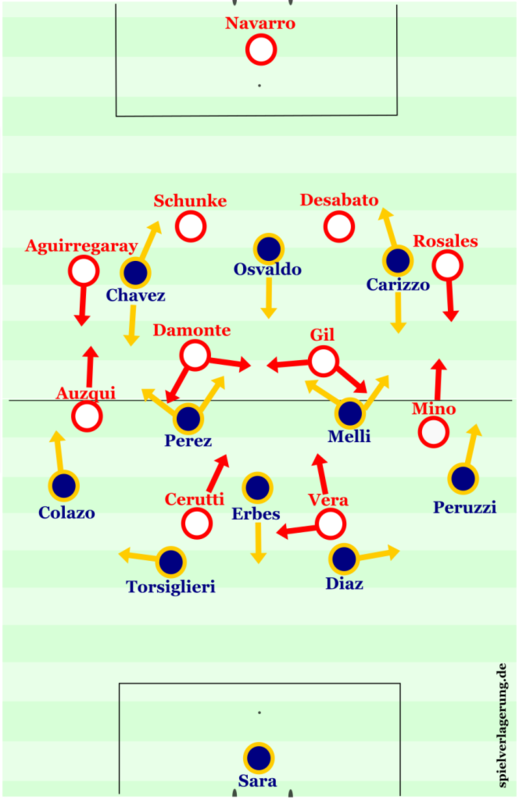 Boca’s final third chance creation strategies were firstly, crosses; with both fullbacks situated very high up the field (an overhit cross would be picked up by the opposing fullback), and Boca’s three forwards in the penalty area. And secondly, through wide overloads with Boca’s two number 8’s being very horizontally fluid, often going to either side to create these overloads. Boca’s chance creation from organised attack was relatively below par for a team with 66% possession, only having four shots on target all match, with one of them (their second goal) being from a counter-attack. It was on the counter-attack, or at least where they could attack at pace due to Estudiantes’ over-commitment in pressing (more on that later), where Boca showed the disparity in talent between the two sides. Boca’s combination play when moving up the pitch at speed was Dortmund-esque and they have many talented runners with the ball, namely Carrizo. Erbes, Boca’s Busquets, played very well in the match. As well as being important in first and second third build-up, he was pivotal in defensive transition as he rarely left the space just in front of Boca’s centre-backs. He provided the game-changing moment in the 39th minute with a beautiful 25-yard strike which dipped over Navarro and into the net to put Boca one-nil up. Something I can’t recall even Busquets himself doing. “in order to be in control you have to hold your emotions.” Marcelo Bielsa. Estudiantes reacted poorly to Erbes’ opener. They committed too many bodies forward in their first attack after going 1-0 down and conceded on the counter attack from it. This was probably more down to their individual stereotypical South American emotiveness rather than a game-management error from the sidelines but it cost them, as there was no way back from 2-0 down. Despite it being only 2-0, it was still in the first half and they showed too much urgency in trying to get back into the match. Their midfielders were suddenly pressing high up the field and became more man-orientated. This left a lot of space in between the defensive and midfield lines as the defence didn’t push up the field accordingly as their midfielder’s commitment clearly wasn’t part of the game plan as they had not been as positionally erratic prior to the goals. Estudiantes continued to show great urgency in getting men forward when they had a rare chance to attack and it cost them as Aguirregaray picked up his second yellow card of the match with a foul which stopped a dangerous Boca counter-attack. Again, this caused Estudiantes’ emotions to get the better of them as the tackles went flying in. Cerutti was booked for a poor tackle in the 65th minute, just one minute after Aguirregaray’s sending off. Then, Estudiantes went down to nine men after Auzqui’s stupid challenge on Carrizo, causing him to receive his second yellow card. Estudiantes went to a 4-3-2 shape after going down to ten players, and then 4-3-1 after going down to nine. This simply allowed more space on either side of the field for Boca to exploit with their switches and also meant they could now switch more through Erbes higher up the field as there was nobody between the midfield and forward to stop this. Boca Juniors were fantastic in this match and are playing some of the best football in South America at the moment. They remain just a point behind San Lorenzo at the top of the thirty team Argentinian Primera and I would put Boca as my favourites, along with Corinthians, to achieve what San Lorenzo did last year–winning the Copa Libertadores. They have the necessary means to do so, including good squad depth and young talent, with 18-year-old Franco Cristaldo coming off the bench to score his first Boca goal in only his second league appearance. Contrasting times in La Plata as Estudiantes sit 13th in the league and face a difficult home tie against Racing Club this weekend. They didn’t really show any attacking threat and they have scored only one goal or less in six of their last seven matches. Nice read ! One of the best performances from Erbes I’ve seen in a long time. That said, Estudiantes were horrible in the extreme. Without Carillo they were toothless in attack, and from early on it was kicking and elbowing on defense. Yeah they were certainly dreadful with the ball. Shows the extent to which Carillo has been carrying them in the Libertadores.